"The Old Lady of Shuter Street"
<b>Boxer Jack Dempsey with hatter Sammy Taft, 1950s. City of Toronto Archives, Fonds 1257, Series 1057, Item 4397.</b><br><br /> <br /> It may be hard to imagine, but Massey Hall was used for sporting events. The trustees had mixed feelings about showcasing boxers and wrestlers, occasionally vowing never to hold matches ever again when people complained such events were rowdy and vulgar.<br /> <br /> One of the hall’s first forays into sports was an appearance by rising boxing star <a href="http://boxrec.com/media/index.php/Jack_Dempsey">Jack Dempsey</a> on April 12, 1919. “The Manassa Mauler” referring some opening bouts, then pummeled a sparring partner in preparation for his <a href="http://www.youtube.com/watch?v=jvCHk_kKpVI">upcoming heavyweight title fight against Jess Willard</a>. According to the World, the hall was “almost overflowing by men and men only—real men who appreciate the art of self-defence.”<br /> <br /> Regular fight nights began in the 1930s and lasted until 1948, when the installation of a concrete floor under the orchestra seats as a fire safety measure meant ring posts could no longer be placed through the stage floor. How do you test a venue’s acoustics? If you’re an expert like Fritz Winckel, you fire a blank from a .38 revolver into the galleries of Massey Hall, as he did in the early 1960s. According to historian William Kilbourn, the result pleased Winckel. “The two second reverberation time, as well as the hall’s dimensions and volume that he had been measuring, corresponded closely to those of the Musikvereinssaal in Vienna and the Concertgebouw in Amsterdam.” In short, Massey Hall ranked with the world’s greats. The acoustics, at least for audiences, have been one of the main draws of Massey Hall since it opened its doors in June 1894. Despite the grief performers occasionally endured from its unusual stage dimension and lack of backstage space, the building has showcased the finest in amateur and professional artists. It has also witnessed political rallies, union conventions, church services, and pretty much anything else that, at its peak capacity, could draw over 4,000 people. 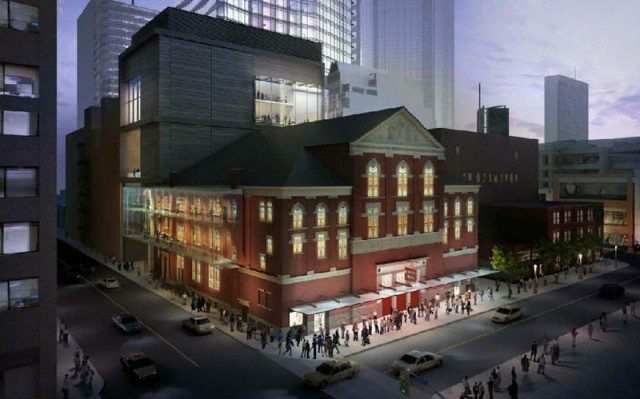 Threatened with extinction when plans were made for a replacement during the 1960s and 1970s—those plans ended up becoming Roy Thomson Hall—the “Old Lady of Shuter Street” is set to undergo major renovations tied into an adjoining condo project. Which gives us an excuse to walk through its history. If you have your ticket, step into the photo gallery. Additional material from Intimate Grandeur: One Hundred Years at Massey Hall by William Kilbourn (Toronto: Stoddart, 1993), the June 15, 1894 edition of the Globe, the May 18, 1953, November 15, 1965, October 13, 1967, April 9, 1969, and July 2, 2013 editions of the Globe and Mail, the June 15, 1894 edition of the News, the June 16, 1894, October 11, 1901, October 7, 1933, May 2, 1964. November 15, 1965, November 19, 1965, November 10, 1972, June 6, 1982, and June 15, 1994 editions of the Toronto Star, and the April 25, 1923, November 11, 1965, November 15, 1965, and April 1, 1967 editions of the Telegram.